The London Stock Exchange is one of the world’s oldest stock exchanges with a history of over 300 years. Its importance is reflected in the fact that it serves as the primary or secondary trading exchange to some of the largest companies globally. Royal Dutch Shell (RDS-A) (RDS-B), HSBC Holdings (HSBC), General Electric (GE), British American Tobacco (BTI), Jardine Matheson (JMHLY) (JARLF), IBM (IBM), Total SA (TOT), BP plc (BP), Boeing (BA), and Banco Santander (SAN) are among the largest stocks listed on the London Stock Exchange. Additionally, its AIM (formerly the Alternative Investment Market) sub-market caters to smaller growth-oriented companies. 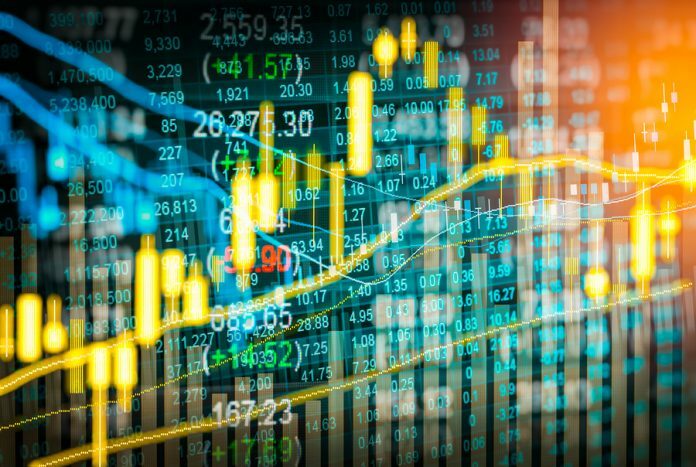 This is where many of the emerging market (EEM) (VWO) growth stocks find it easier to list, given the exchange’s flexible and responsive system of regulation. We filtered the universe of stocks listed on the AIM exchange as of July 2017 which yielded results illustrating that emerging markets are capturing an ever growing proportion. About 3.24% of the market capitalization of companies listed on the exchange is dominated by Chinese companies (FXI), ahead of the American firms (SPY) (IWM) which command about 2.90% of the market’s capitalization. The African (EZA) continent has a 2.83% representation in the market; India (EPI) and Bangladesh stand at 1.67%, Russia (RSX) and CIS nations at 1.53%; and other Asia Pacific (AAXJ) (VPL) economies at 1.69% (see chart above). 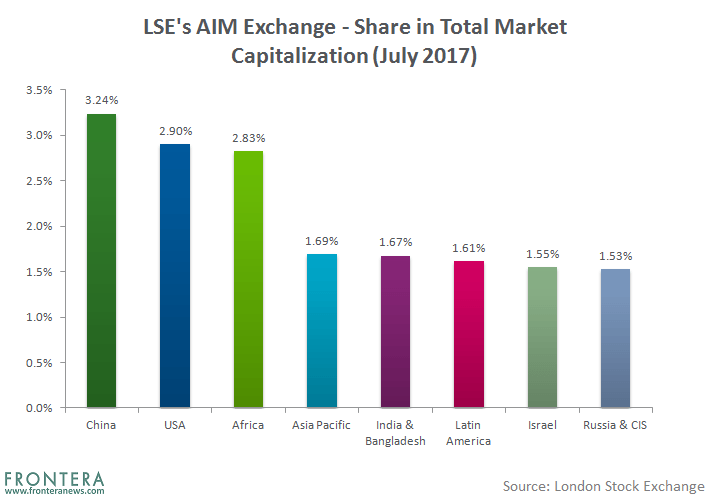 In all, about 90 companies based in the Asia alone commanded over 8% of the total market capitalization at the LSE’s AIM exchange. We further filtered out a list of the top 10 largest emerging market stocks listed on the London Stock Exchange. Interestingly, Asian economies dominate this list too, with 4 out of the top 10 companies being based in China; 1 in Russia, and 1 in Bangladesh. Let’s take a quick look at these companies. Exchange rate used for calculating US dollar equivalent of market capitalization quoted in £ was as of August 28. Russia’s number 1 integrated oil company, PJSC LUKOIL, explores for, produces, and refines, transports, and markets oil and gas mainly from Western Siberia. 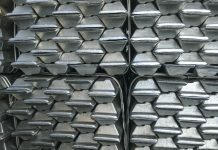 The company is also engaged in the manufacture of petrochemicals, fuels and other petroleum products. The company’s London-listed ADR, LKOD, trades on the Main Market and sported $38.3 billion market capitalization as at July end, making it’s the largest emerging market stock listed on the LSE. The ADR is down 12.11% YTD as of August 25. As of July 31, the stock traded at a P/E ratio of 10.6, far below its global competitors such as BP, and Royal Dutch Shell which traded at 120 P/E and 47.5 P/E than at that time, according to FTSE data. Dividend yield for the stock stands at 5.3%, below the above mentioned global peers. With a 6.5% ROE, the ADR has 88.2% BUY recommendations from analysts that reviewed the stock, with consensus standing at 4.76/5 (from a buying perspective). A leading people-mover in China, Air China provides domestic and international passenger and cargo transportation, along with airline-related services in China. The state-owned airline recorded a 3.3% jump in earnings in 1H17 on a YoY basis, despite a 40.1% surge in jet fuel cost. The company’s London-listed stock, AIRC, trades on the Main Market and sports a $4.6 billion market capitalization. Recent trading information for the London-listed stock was not available. The Hong Kong-listed stock of the company, 753, is trading at a P/E of 10.44, with an estimated forward (Dec 2017) P/E of 11.00. Air China’s stock (753.HK) was up 38.38% YTD (as of August 29). The stock has 47.8% BUY recommendations from analysts that reviewed the stock, with consensus standing at 3.74/5 (from a buying perspective). China-based Zhejiang Expressway designs, constructs, operates and manages high-grade roads. The company is also engaged in ancillary services such as technical consultation, advertising, automobile servicing, and fuel facilities. The company’s London-listed stock, ZHEH, trades on the Main Market and sports a $1.8 billion market capitalization. Recent trading information for the London-listed stock was not available. The Hong Kong-listed stock of the company, 576, is trading at a P/E of 11.69, against an estimated forward (Dec 2017) P/E of 11.17. Zhejiang Expressway’s stock (576.HK) was up 33.51% YTD (as of August 29). The stock has 66.7% BUY recommendations from analysts that reviewed the stock, with consensus standing at 4.33/5 (from a buying perspective). Datang International Power Generation develops and operates power plants, sells electricity, repairs and maintains power equipment, and power-related technical services. The company’s London-listed stock, DAT, trades on the Main Market and sports around $1.6 billion market capitalization currently. Recent trading information for the London-listed stock was not available. The Hong Kong-listed stock of the company, 991, is trading at a P/E of 7.43, against an estimated forward (Dec 2017) P/E of 13.04. Datang International’s stock (99.HK) was up 28.57% YTD (as of August 29). However, the power producer posted a 36% drop in 1H17 YoY profits due to a surge in coal prices and a subsequent fall in power prices. The uptrend trend in the stock price, therefore, may not continue at the same pace from here on. Consensus rating for the stock stood at 3.31/5 from analysts that reviewed the stock (from a buying perspective). Barloworld Limited is a distributor of brands that provides integrated rental, fleet management, product support and logistics solutions. Southern Africa accounts for 70% of Barloworld’s sales, with the rest being spread across 25 countries globally. Among the largest Caterpillar (CAT) equipment and engine dealers, the company offers earthmoving and power systems, car rental, motor retail, fleet services, used vehicles and disposal solutions, logistics management and supply chain optimization and material handling. The company has been recently engaged by gold producer, B2Gold (BTG), along with Caterpillar Inc. to supply a 7 MW solar power plant at the Otjikoto mine, in Namibia. The company’s London-listed stock, BWO, sports around $1.6 billion in market capitalization. As at July end, the stock was trading at a P/E ratio of 12.6, much below its global peers such as RPC Group, Vesuvius, and Coats Group that were trading at 28.2, 25.9, and 25.4 P/E respectively, according to FTSE data. Estimated forward P/E for the stock stood at 10.67, according to Bloomberg data. With a 9.8% ROE, the ADR has 53.8% HOLD recommendations from analysts that reviewed the stock, with consensus standing at 2.69/5 (from a buying perspective). DataTec Limited is a distributor of networking and data communications hardware products to the information technology, computer networking, and communications industries. The company operates in more than 50 countries, with its European operations accounting for more than two-thirds of revenue, followed by North America with about 25%, Latin America, about 15%, and Asia-Pacific and the Middle East and Africa, about 10% each. The company’s London-listed stock, DTC, trades on the AIM exchange and sports $944 million in market capitalization. The ADR was up 26.9% YTD (as of August 25). As at July end, the stock was trading at a P/E ratio of 120, far above the industry average P/E of 47.4, according to FTSE data. Seplat Petroleum Development is an independent oil & gas exploration and production company incorporated and operating in Nigeria. The company has a strategic focus on Nigeria. The company’s London-listed stock, SEPL, sports a $770 million in market capitalization. The stock was up 44.8% YTD as of August 29 and has an estimated forward P/E ratio (12/17) of 45.85. The stock has 75% BUY recommendations from analysts that reviewed the stock, with consensus standing at 4.33/5 (from a buying perspective). A prominent pharmaceutical player, Beximco Pharmaceuticals manufactures and sells generic pharmaceutical formulation products, active pharmaceutical ingredients (API) and intravenous (IV) fluids. The company’s London-listed GDR, BXP, sports around $345 million in market capitalization. The GDR was up 11.6% YTD as of August 25. The GDR has 100% BUY recommendations from analysts that reviewed the stock, with consensus standing at 5/5 (from a buying perspective). This Bangladesh stock is also a standout for frontier market fund managers. Poland-based Work Service SA operates as a human resources company. Work Service serves companies in Czech Republic, Slovakia, Russia, Germany, and Ukraine. The company’s London-listed stock, WSE, sports around $185 million in market capitalization. The stock has 50% BUY recommendations and 50% HOLD recommendations from analysts that reviewed the stock, with consensus standing at 4/5 (from a buying perspective). Green Dragon Gas is an independent upstream company operating in China’s coal bed methane (CBM) gas sector. The company recently received approval for project code for the overall development plan (ODP) on the Greka Shizhuang South Zaoyuan portion of the Main Block (GSS), which will enable the company to accelerate commercial gas production. Green Dragon has a 60% participating interest in the GSS block, while the remaining interest is held by CNOOC’s (CEO) wholly owned subsidiary China United Coalbed Methane (CUCBM). The company’s London-listed stock, GDG, has $132 million in market capitalization currently. The stock is down 64% YTD (as of August 29). The stock has 100% HOLD recommendations from analysts that reviewed the stock, with consensus standing at 3/5 (from a buying perspective). 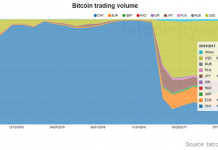 How Much Asian Venture Capital Is Plowing Into Bitcoin And Blockchain Technology?